The Art Bulletin: Vol. 60, No. 2 (Jun., 1978), pp. 214-231. 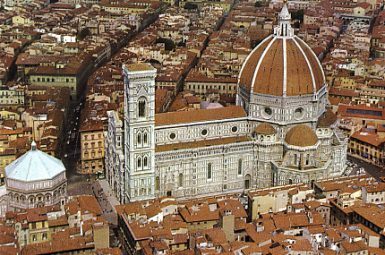 No list of the outstanding Gothic monuments of Europe could fail to include the Cathedral of Florence, yet its place in medieval architecture remains anomalous. Anomalous above all is its unprecedented design, which integrates a rib-vaulted basilica, a domed octagon, and a triconch of fifteen extruded chapels. What other building in Europe combines so many vocabularies (Early Christian, Byzantine, Romanesque, Gothic) and national traits (Italian, French, German) before the nineteenth century? Hardly less anomalous are the numerous construction scars still visible on the surface: vaults without buttresses and buttresses without vaults; fake windows inside and blocked windows outside; doors off-axis; violent jumps in scale; and a roof ridge that pokes out the west eye of the cupola drum (Figs. 1-3).’ Parallel to the disjointed state of the physical fabric is the disarray of the archives, especially the loss of detailed building records from the ground-breaking in 1293 until 1353.2 A further complication in writing an architectural history of S. Maria del Fiore is the shadowy record of its founding architect, Arnolfo di Cambio. An undated plaque at the southwest corner of the Duomo names Arnolfo as the cathedral builder at the time the cornerstone was laid in 1296: a government document of 1300 confirms this status. A third and final document connects Arnolfo to the cathedral works on the day of his death, March 8, but fails to specify the year: historians place it between 1301 and 1310, inclusive. Such scanty documentation renders the “Arnolfo problem” three-fold: the length of his tenure as master-builder might have been anything between seventeen years (1293- 1310) and five years (1296-1301); Arnolfo was a sculptor, and he is not documented as the architect of any other building save Florence Cathedral itself; and finally there is no documentary evidence of what his plan for the Duomo looked like, or how far he carried this plan into construction, or that he had actually devised a plan at all.